Reachability Cursor: one-handed mode mouse pointer is a new application for Google Android to control big Android devices with a single hand. Smartphones seem to get bigger with every passing year; while that is great on the one hand as that usually goes hand in hand with a bigger and better screen, it is not so great on the other hand for a number of reasons. If your hands are not as big as that of The Mountain from the Game of Thrones TV show. If you prefer to control a device with a single hand. If you want to carry your device in a pocket. If you bought the latest Samsung Galaxy Note or Google Pixel 2 XL, or any of the other smartphones that is equally large, you may have noticed that it is difficult to control the device with a single-hand. 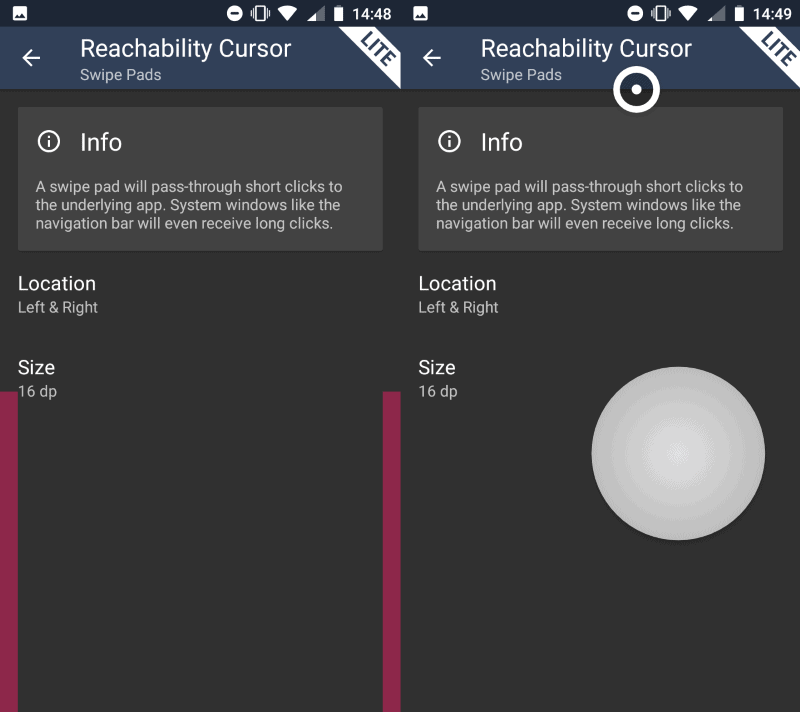 Readability Cursor is an application that improved one-handed mode by adding a cursor to the screen that you control using touch. As is the case with these kinds of apps, it is necessary that you give it accessibility permissions before you can start using it. You can start using the app right away once that is out of the way. Swipe up or down in specifically designated areas to display the cursor on the screen and control it by moving the finger that activated it around on the device. The main idea behind the feature is to give you access to areas of the screen that you cannot reach anymore if you control the phone with a single hand. The cursor and a larger circle are visible on the screen of the device when you activate the functionality. To activate something, move the cursor on it, e.g. an icon, and tap on the circle to simulate a touch action. Doing so over an application launches it on the device. The cursor works with all elements on the screen including notifications, widgets, applications, icons, and even in apps such as web browsers to activate buttons or the address bar. The cursor disappears automatically when you touch something else or after a certain period of inactivity. Open the Swipe Pads page of the Settings to control the width of the areas that register the actions to display the on-screen cursor. A Pro version is available to change the location of the Swipe Pads and to change other appearance related settings. The Pro version supports advanced features such as drag gestures, Edge actions for quick access to certain features, or long clicks support. The pro version is available for €4.79 at the time of writing (likely $4.99). Reachability Cursor: one-handed mode mouse pointer is a great application for users who use big Android devices. Designed to control the device with a single-hand, it may also be useful for users who prefer to use a cursor instead of their hand directly to activate certain elements on the screen. Now You: How big is your phone? I’d rather have a phone I can actually use one handed (<4.5" screen with small-ish bezels) than all these stupid enhancers. The iPhone SE would be perfect for me if it weren't for two points: 1. it's discontinued with no successor and 2. it doesn't run Android. In my opinion, you shouldn’t buy a phone you can’t use with one hand. But, hey, buy what you want! Sometimes you can’t. I needed a new phone as my Nexus 4 broke (which for me it had the perfect size for a phone), but I didn’t want to spend a fortune on it, so I bought a Xiaomi Mi A1 for 6600 UAH in march. I could not find anything matching the specifications of this phone for this price but in a smaller more compact formfactor. I reach about half of its screen with one hand, so it’s fine for making phonecalls, but I can’t pull the notification centre, reach the first two icon rows or switch tabs in Chromium. At least not without repositioning the phone in my hand and risk dropping it in the process. Sony xperia xz1 compact ia your only choice. Xz2 has no 3,5mm plug and is crazy tall. Once that dies I’ll probably just see how far ai can get without a smart phone. Never had much inclination for carrying around a “phone” that makes most TVs look small. My phone has a 5″ screen. Personally, I think this is the perfect size — it fits into my pockets, but is large enough to be comfortable to use as a portable computer. This sort of app, though, doesn’t sound useful to me as I never developed the habit of using a phone one-handed in the first place, even with tiny feature phones. Good point. Availability and price can be driving factors. Martin, it looks like you have Ctrl-Forward and Ctrl-Back keys mapped to navigating articles on your website. This is a standard shortcut to go forward or backward a word while editing text. I lose the comment I’m writing on your site, when I hit these keys trying to edit my comment. Can you please remove this shortcut? Which browser did you use when you noticed the shortcuts? Is this on a tablet or on a desktop computer? Opera on a desktop. The default Opera mapping for Ctrl+Arrow has been removed. I did not make any deliberate changes to the mapping. Are you sure it is not caused by an extension or modification? I tried in Opera and it did not work on my end. Which version of Opera do you use? Actually, my *real* phone has a 5.2″ screen and, being a relic of the pre-touchscreen, pre-smartphone era, I already have more than enough trouble doing stuff on it accurately using *two* hands.